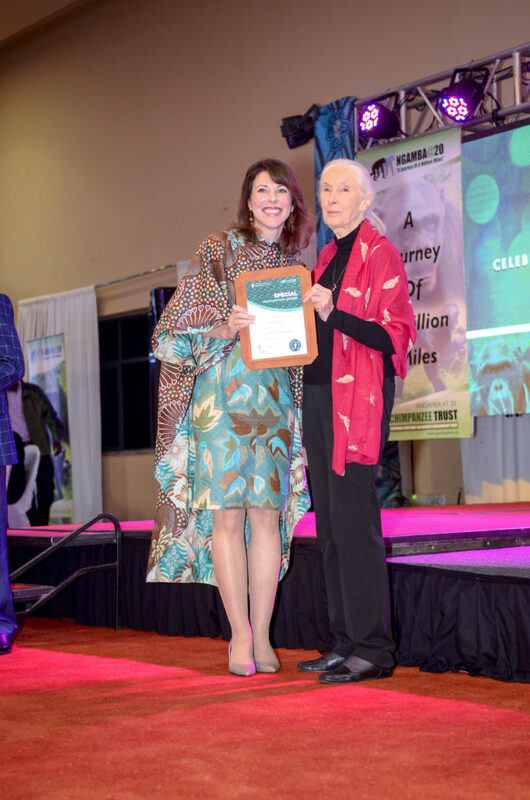 Children of Conservation founder and board member, Michele Stumpe, was honored at a lavish ceremony in Kampala, Uganda in June, for her services to chimpanzee conservation and care. 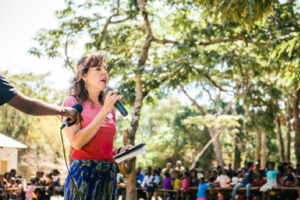 Michele, who started Children of Conservation nine years ago with her husband, Kerry, aims to conserve African endangered wildlife by supporting the communities of people living around habitats and sanctuaries. 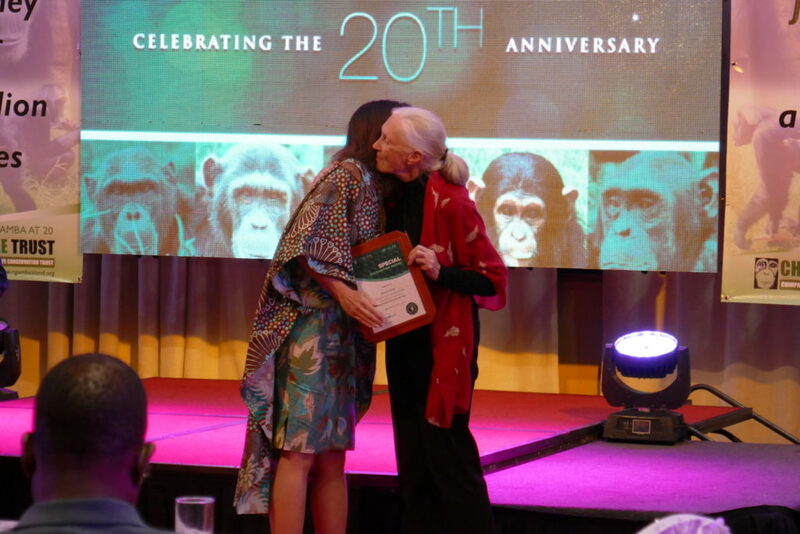 She traveled to Uganda with other members of Children of Conservation’s board to visit Ngamba Island Chimpanzee Sanctuary in Uganda where 55 children of sanctuary workers receive scholarships to attend school because of her good work. 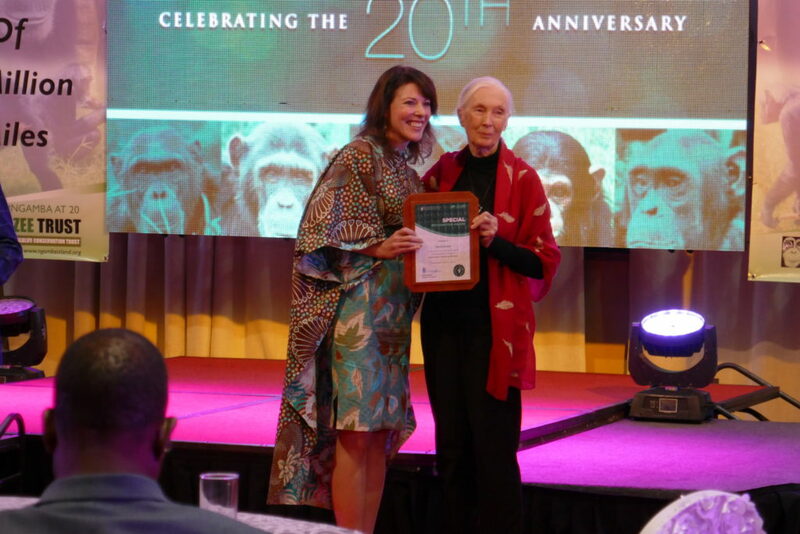 During the visit, Ngamba Island celebrated its 20-year anniversary and held a gala attended by the First Lady of Uganda and renowned chimpanzee expert and conservationist, Dr. Jane Goodall. 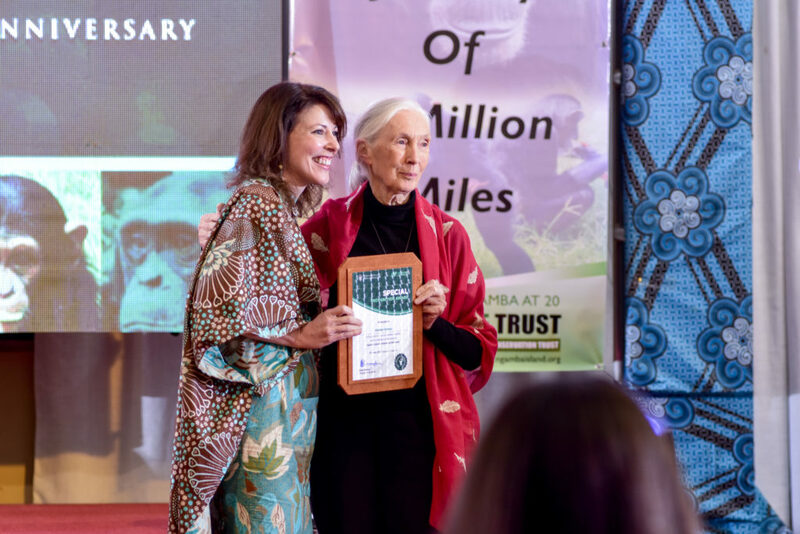 Michele was awarded a special plaque at the event for her services as a trustee of Ngamba Island, and it was presented to her by Dr. Goodall. Michele, a resident of Atlanta, said: “It was an honor to meet Dr. Goodall. She’s been a hero of mine for many years and her work for animals in Africa and beyond is so inspiring. I’ve been working with apes since I was 12 years old and her work with chimpanzees has been so pivotal to helping us learn how to try and help this endangered species. Ngamba Island is home to 49 orphaned chimpanzees. Many of the chimps have been rescued from circuses and other forms of exploitation and others have been seized by customs officials during attempts to smuggle babies out of the country for sale on the exotic per market. 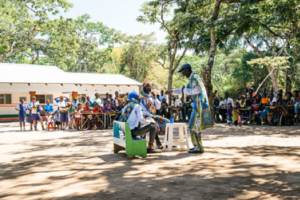 The name Chimfunshi means “place that holds water” in Bemba, one of the Zambian languages – and not without reason. The nearby Kafue river floods large parts of the grasslands and bush area every year during the rainy season, when 4-wheel drive is essential for use of the roads. Chimfunshi is one of the oldest and largest chimpanzee reserves in the world and is internationally recognized as such. The Chimfunshi Wildlife Orphanage is sheltering 120 chimpanzees at the Project Area and Orphanage located in the Copperbelt Province of Zambia. Chimpanzees from all over the world are rescued from poachers and amusement parks and brought to the Orphanage at Chimfunshi. Most of them are injured and traumatized and need intensive care. As soon as they are in good health, they are carefully integrated into one of the chimpanzee families. The Chimfunshi property encompasses more than 4200 hectares. In addition to providing the chimpanzees with forested enclosures, part of this land is dedicated to five villages where the Chimfunshi staff and their families live and a primary school, health clinic, Education Centre and farm have been developed. Chimfunshi combines the protection of a species, social and educational projects in a unique way: Chimfunshi employs and feeds 70 families – about 300 people, 150 of whom are children. More than 60% of the Zambian population lives below poverty level. Considering this, Chimfunshi is an important local employer that offers residents work as animal keepers, technical staff and service staff. Chimfunshi also contributes the local economy by purchasing food for the chimpanzees from local farmers. 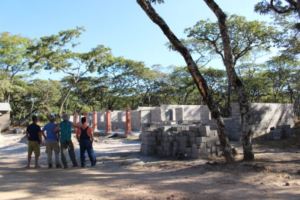 The construction of houses for staff members, wells that ensure the supply of fresh drinking water, clothing, toys, and educational material are regularly provided to the community. 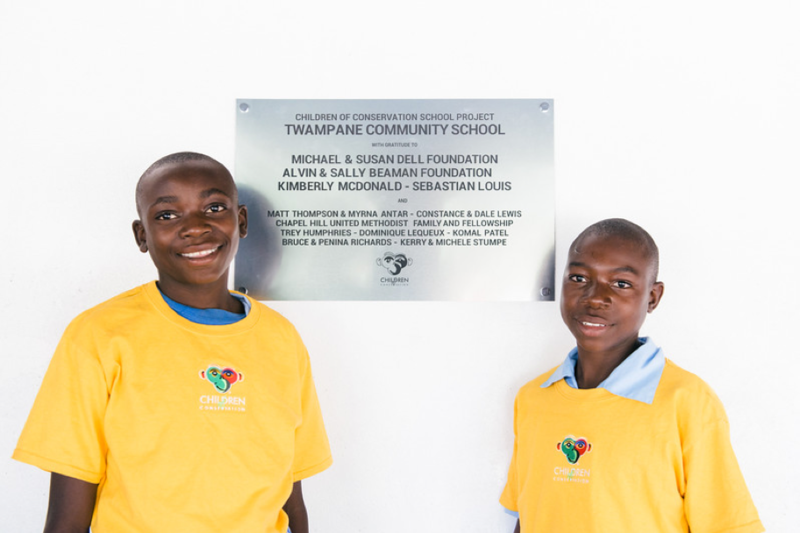 Twampane Primary School was built by the Chimfunshi Chimpanzee Wildlife Orphanage to serve the children of its workers and neighboring villages as the closest school is 42 km away. 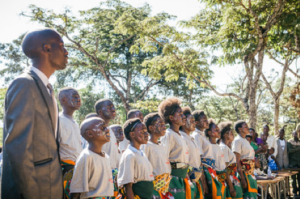 Twampane Primary has made great strides in improving literacy and education for these hard-working villagers. However, without higher education, these children have no hopes of ultimately becoming a part of the University system through which to gain meaningful employment. 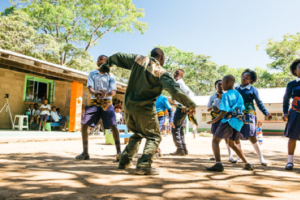 In early 2016, Children of Conservation, the community and management of Chimfunshi in coordination with the Zambia Government developed a plan and capital campaign to build a Government Certified Secondary School. If the school was built, the Government would commit teachers and their salaries. Through CofC contributions, individual donations of all, the many hands of volunteers and community and with kind support of family foundations, the school began construction in late summer 2016. 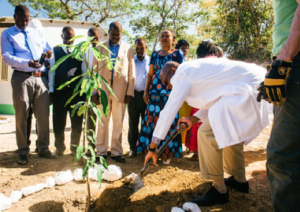 In May 2017, Children of Conservation finalized construction of the first secondary school ever built in the villages surrounding Chimfunshi Wildlife Orphanage. At its Inauguration, Government education officials inspected and approved certification of the school, and committed to working with Chimfunshi to make the school a National Exams testing center. The first classes began June 2017 with 67 secondary students entering the school, with ages among 11 to 21. In 2019, there are 190 students attending the school. 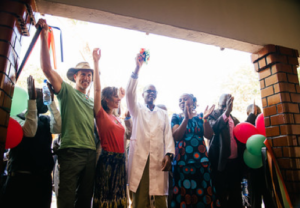 The opening of the school was attended by government officials, leaders of the community, proud parents, management and staff of Chimfunshi and the Children of Conservation Team. Words of inspiration, hope and congratulations were offered by Road Improvement Minister: Ministry of Works and Supply – Hon. Matthew Nkhuwa, MP, Sebastian Louis, Trustee of Chimfunshi, entering students and Michele Stumpe, Children of Conservation founder. Commitments were made to improve the road to Chimfunshi, continue support to the schools and make the new school a National testing center. 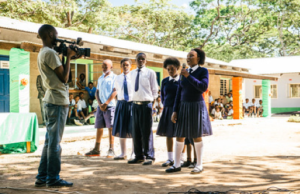 Children of Conservation and Chimfunshi have continued supporting scholarships and adding to the school with our daily lunch program and library. 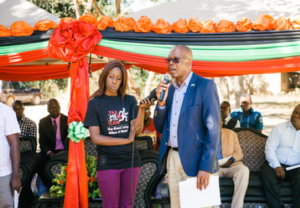 The entertainment highlights of the event were provided by students with support from the teachers offering singing of the Zambian National Anthem, songs and dancing with spontaneous participation and support from local parents, and an engaging teacher led comedy skit. In many cultures trees are planted for special occasions, a marriage, a new children or new beginnings. 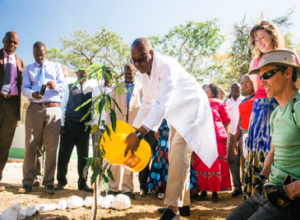 As part of the inauguration of Chimfunshi Secondary School, Children of Conservation and the community planed mango and avocado trees in the school yard to provide future shade and nutrition in lunch programs, to be nurtured by the students as their new educational futures grow and blossom to become new leaders for Zambia. It took the hard work and support of many financial contributors, the helping hands of volunteers and community members, the hard work, support of friends and family, and the dedication of Chimfunshi staff and community to achieve this school! Thank you all for making a dream come true! Jonathan Kang was the first child from his small village in Africa to finish high school, let alone attend university. His parents and grandparents all worked extra jobs to ensure his education. Upon graduating from university, Jonathan visited friends in Cameroon. While there, he came across the Limbe Wildlife Centre, a sanctuary for endangered gorillas, chimpanzees and drill baboons orphaned by the bushmeat trade. It was there that he realized his unique passion for conservation and education. Jonathan applied for a job at the Centre but was told that there were no openings. To this he responded, “then I will work for free, and when a job becomes available, you will hire me because you will see that I am a smart man and a hard worker.” Jonathan volunteered for 3 months before a groundskeeper position opened. When he asked about the job, the head of the Centre lamented that he was over-educated and too good of a worker to take such a low paying job. Jonathan responded “I will take the job and when a better position becomes available, you will promote me because you will see that I am a smart man and a hard worker.” Through years of such dedication, Jonathan eventually became the Centre’s Head Keeper, a prominent position he holds to this day. 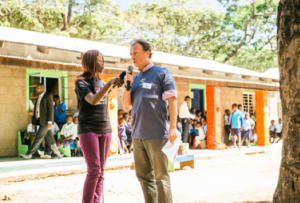 Many sanctuary workers throughout the world share Jonathan’s passion for conservation and education. Unfortunately, those ideals are not always popular in countries where the bushmeat trade, poverty and starvation run rampant. Children of Conservation believe that lasting change requires taking a more global view towards conservation. Education is a key component of such an approach. In many developing countries, schooling past the 2nd grade is not government funded and is cost prohibitive to the majority of the population. Like Jonathan’s experience, it becomes a full family effort to put just one child through school. Inspired by Jonathan’s story, our primary project provides educational scholarships for children of sanctuary workers. Our core idea is to help keep the children (who are inspired and raised by their sanctuary worker parents) in school. 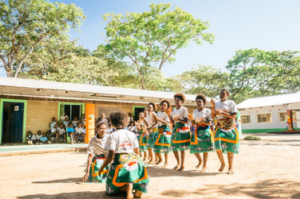 As such, when they become the leaders and teachers of their communities, they will pass along the importance of education, preservation and conservation. Travel blog posts from Children of Conservation founders, Michele and Kerry. Day 1 - Myende Model Conservation Community. Ok, not really day 1, a lot of people have been working on this idea for the past year, linking up the initial players, meeting with the community, etc. But today we start putting pencil to paper, meeting with surveyors,, lawyers and government officials to start working on the MOUs, etc. After a late night arrival, I woke up this morning to the bustle of birds and early morning traffic that says "Welcome to Entebbe." I feel as if I've come back home after a long stint away. As I prepare for this next week of meetings, I'm missing Kerry and feeling a little hampered by him not being here. We're both just fine in meetings on our own, but he has this innate ability to balance out my "serious mode." In a culture that"s ultra formal when it comes to meetings, but also heavily built on relationships, his way of putting people at ease with his genuine demeanor always amazes me. He's my Marty Ginsberg - brilliant in his own right but always pushing me (and keeping everyone laughing when in the tense times). This is our first project where, as an organization, we're really having to divide and conquer. It will allow us all to be a part of accomplishing something truly amazing, but I'm missing my home "team" right now. (Kerry Stumpe, Lorna Campbell, Myrna Antar, Dennis Dean, Kimberly McDonald, Brenda Isaac - you guys all saw this idea and have made it your passion to accomplish. What an honor it is to get to be the one taking what you all have helped set in motion and kick start it here in Uganda!). In a few hours, I'll be meeting our team here in Uganda: Lilly Ajarova, Silver, Dr. Joshua - of course, they will be the true heroes at the end of this project, after all, this whole project started with THEIR idea, a dream of building a symbiotic relationship that is mutually beneficial to conservation and community. For now, I'm feeling humbled and grateful while enjoying a nice fruit plate at the modest but lovely Gately Inn to start the day. Is it just me or is the fruit actually sweeter in Uganda? Children of Conservation is a nonprofit, tax exempt 501(c)(3) organization.